Harbinger - The General Screw Steam Shipping Co. Ltd.
Machinery: 70h.p. By Maudslay & Co. 9 knots. Decks: Two decks with a break, and three masts. Mans bust figure head. Type: Auxiliary Screw. Gun Brig with 12 guns. 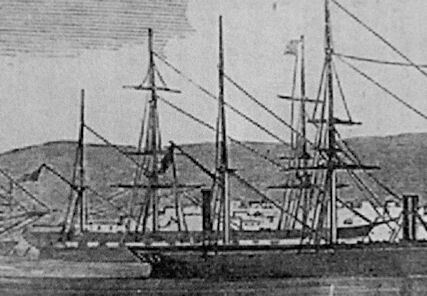 Bargue rig in 1851. Registered: No.188 on 20th June 1851 in London. No. 395 on 8th July 1854 in London. Other info: Launched at 3 o'clock by Lady Adeline Paget. Crew in 1851 = 35. Crew in 1854 = 18. Certificate granted 9th June 1851. Certificate granted 30th June 1854. History: 1846. Built for the Admiralty as the 'Recruit'. Iron Brig 12•462bm. It was the only iron-built sailing vessel in the Royal Navy. 2nd July 1846. Commander Adolphus Slade has been appointed to the vessel. 5th July 1846. Lieutenants W. Horton & O. Borland, and Master T. Bowen have been appointed to the vessel. 11th July 1846. Towed into the West India Dock Yard to be fitted up. 12th July 1846. Commander Adolphus Slade, is all a taunt in Sheerness Dock, from which she will be moved next week. There has been considerable work for the blacksmiths on this vessel cutting out air scuttles, openings for block tackles, etc. Only one or two seamen have as yet entered for her. 19th July 1846. Lieutenant C. B. Strong, Surgeon C. Coffey, and Purser G. H. L. Wise have been appointed to the vessel. 12th April 1847. Arrived at Spithead. 13th April 1847. Court-martial held in Portsmouth of Gunner James Smyth for desertion on the 15th July 1846. 16th April 1847. In Portsmouth harbour to have her iron cleaned. The execution of the corporal part of the punishment awarded by the court-martial to the deserter Smyth, has been delayed, and will be inflicted prior to coming into harbour. 18th April 1847. She was dock at Portsmouth to have her bottom cleaned. Although this vessel has been in commission only nine months, and has been docked twice before this for the same purpose, the growth of weeds upon her was truly astonishing, forming a thick cluster just below the line of flotation, more resembling a luxuriant crop of grass in a field than the bottom of a brig of war. 21st April 1847. In Portsmouth Basin. When she comes out, she will be docked to have her waterways repaired, and other defects made good, which will occupy about a month. 22nd April 1847. Received a coating of composition which is expected to have the effect of preventing the adhesion of rubbish to her bottom. 7th May 1847. Commander Slade, at Portsmouth, expects orders to proceed to the Mediterranean station. 11th May 1847. Sailed from Portsmouth harbour and will sail immediately for Plymouth with the blue-jackets belonging to the Caledonia, which have been employed in navigating the ‘Avenger’. 9th August 1847. A letter from Commander Slade was read by their Lordships, proving the good properties of the composition on the vessel, and the total inefficacy of the red lead on the other side of her. 11th September 1847. The ship is said to be a sad failure. She will not sail more than from five to six knots per hour. One side of her bottom is as smooth as new iron, having been coated with Hay’s composition; the other side is very foul, having weeds from two to three feet long adhering to it. This side was coated with red lead. 16th September 1847. At Maderia. 4th October 1847. Sailed from Lisbon. 12th October 1847. Arrived at Spithead. Having a very foul bottom on the starboard side was not considered to make a respectable passage to England, consequently no despatches for the London daily journal’s were in trusted to her; she has, however, shown her capabilities, and reached Spithead within eight days. 22nd October 1847. At Spithead. 29th October 1847. At harbour at Portsmouth. 2nd November 1847. She has been found so utterly unworthy of the pennant that the Admiralty have resolved on depriving her of that honourable indication of her character. She will be sold out of the navy. 7th November 1847. Paid off, having been declared unfit for further service. This vessel went 10 knots with grass on her bottom a foot long, and the ship out of trim considerable in her late sailings. 28th August 1849. Sold to Mr. Mare. Resold after conversion to screw ship. 5th February 1850. Arrived at Gravesend from Moulmein. 16th May 1850. Re-launched after lengthened and converted to screw. Tons 598 nett 847 gross. 15th October 1851. Sailed, at noon, from Plymouth for the Cape of Good Hope. Captain Lane. 27th October 1851. Arrived at St. Vincent at noon. 28th October 1851. Sail from St. Vincent at midnight. 3rd November 1851. Arrived at Sierra Leone. Detained due to an accident to screw. 6th November 1851. Sailed in the evening from Sierra Leone. 26th November 1851. Arrived, 5a.m., at Cape of Good Hope. 2nd December 1851. Sailed from Cape of Good Hope for Plymouth with a full cargo of wool at 4 p.m.
16th December 1851. Arrived at Sierra Leone in the evening. Repaired screw. 17th December 1851. Sailed from Sierra Leone. 21st December 1851. Arrived at St. Vincent in the evening. 23rd December 1851. Sailed from St. Vincent at 6 p.m.
6th January 1852. Arrived at Plymouth at 9·30 a.m.
9th February 1852. In collision with a brig ‘Resolution’, which sank, while steaming down the river Thames, at Northfleet, on her way to Plymouth. The ‘Harbinger’ went aground. 10th February 1852. Re-floated off and continued on her way. 15th February 1852. Sailed from Plymouth for the Cape of Good Hope. Captain John William Lane. She had a large quantity of jewellery, 8000/- in specie and about 1000 rifles from the Tower of London as cargo. All her berths, forty-five, were taken. 26th February 1852. Arrived at St. Vincent. 2nd March 1852. Arrived at Sierra Leone. 24th March 1852. Arrived at Cape of Good Hope at 6a.m. 26th March 1852. Parted from her moorings. An anchor was immediately dropped, but owing to the sudden jerk with which the vessel brought up, the chain snapped, and she drifted in the direction of Amsterdam Battery. The engines having been taken down for repairs, it was thought prudent to stand out to sea for the night. 27th March 1852. Returned to Table Bay the next afternoon, after putting her machinery in working order. In the attempt to clear the shipping, she ran foul of the ‘Gratitude’ and stove in her bulwarks. The damage sustained was slight. 1st April 1852. Sailed from Cape of Good Hope at 4 p.m. for Plymouth. 16th April 1852. Arrived at 5 p.m. and sailed in the evening from Sierra Leone. 21st April 1852. Arrived at 7 a.m. St. Vincent. 23rd April 1852. Sailed from St. Vincent. 6th May 1852. Having experienced severe weather she running short of coal. 6th May 1852. Coaled at the Scilly Islands. 7th May 1852. Arrived at Plymouth at 11 a.m. from the Cape of Good Hope. June 1852. Purchased and renamed by the G.S.S.S.Co. 10th July 1852. Due to sail from the East India Docks for Plymouth. Captain John William Lane. 15th July 1852. Sailed from Plymouth for the Cape of Good Hope. Captain Lane. 28th July 1852. Arrived at St. Vincent. 8th August 1852. Arrived at Ascension. 21st August 1852. Arrived at Cape Town. 25th August 1852. Sailed from Cape Town. 15th October 1852. Sailed from Calcutta. 21st October 1852. Sailed from Madras. 22nd October 1852. Spoke to ‘Lady Jocelyn’. 25th October 1852. Sailed from Ceylon. 6th November 1852. Sailed from Mauritius. 18th November 1852. Arrived at Cape Town. While in the bay a storm broke out put out both anchors immediately but both cables parted, but fortunately her steam was up, and she ran out to sea. The danger in which she was placed had drawn public attention to the subject of a breakwater, which was duly done. 20th November 1852. Sailed from Cape of Good Hope. 25th November 1852. Sailed from St.Helena. 2nd December 1852. Sailed from Ascension. 12th December 1852. Sailed from St.Vincent. 22nd December 1852. Arrived at Plymouth having made the quickest passage from India and back on record. 24th December 1852. Arrived at Southampton. 6th January 1853. Arrived at Plymouth from the Cape of Good Hope. 25th January 1853. At Southampton Docks. 11th February 1853. Sailed from Southampton to Port Phillip and Sydney with 64 passengers. Captain Lane. 24th February 1853. Sailed from St. Vincent. 21st March 1853. Arrived at Cape Town in the evening having been under sail for 14 days and 18 hours. 25th March 1853. Sailed from Cape Town. 21st April 1853. Arrived at Melbourne. 25th April 1853. Sailed from Melbourne for Sydney. 29th April 1853. Arrived at Sydney with 35 passengers From Melbourne. 6th May 1853. His Excellency the Governor-General paid the ship a visit and after an inspection of the vessel and machinery, expressed the highest admiration of her accommodation and arrangements, then had refreshments on board. 12th May 1853. Arrived at Sydney with 50 passengers. 19th May 1853. Sailed for Melbourne. 22nd May 1853. Arrived at Port Phillip. 21st June 1853. Arrived at Mauritius. Owing to the bad quality of coal supplied at Sydney, she had to make a 600 mile detour to this port to obtain a supply of fuel. 1st July 1853. Arrived at Algoa Bay for coal. 3rd July 1853. Sailed from Algoa Bay. 6th July 1853. Arrived at Table Bay for coal. 7th July 1853. Sailed from Cape Town. 3rd August 1853. Arrived at St.Vincent. 18th August 1853. Arrived at Southampton from Australia with seventy-three passengers, and gold dust and bars weighing 130,000 ounces, and of the estimated value of £520,000. Beside this, many of the passengers have various quantities, the value of which it is difficult to ascertain, but - which probably amounts to from £30,000 to £40,000 more. 250 mail bags and boxes of letters. 5th October 1853. Sailed from Southampton, Captain J. W. Lane, for Port Phillip and Sydney. She had 35 passengers, £500 in specie, a good general cargo, plus jewellery to the value of £5,000. 24th October 1853. Arrived at St. Vincent. 28th December 1853. Arrived at Melbourne. 30th December 1853. Arrived at Sydney’s Moore’s Wharf with 59 passengers. 11th January 1854. Sailed for Melbourne in ballast. 22nd January 1854. Sailed from Melbourne for Southampton. 25th February 1854. Rounded Cape Horn. 31st March 1854. Spoke to the 'Propontis' after just leaving St. Vincent. April 1854. Put into Plymouth for repairs after she run into the ‘Mary Hay’. 19th April 1854. Arrived at Southampton from Melbourne, with 22 passengers and 13 children. She also brought from Sydney, 16,174oz of gold, 28,88lb of wool, and from Melbourne, 57,168oz of gold and 25,00lb of wool. 1854. Became a transport for the Government. 14th May 1854. Sailed from Royal Arsenal for Purfleet, then onto Turkey with troops. 21st May 1854. Passed the Straits of Gibraltar. 11th July 1854. Sailed from Constantinople for Portsmouth. 17th July 1854. Sailed from Malta. 24th July 1854. Sailed from Gibraltar. 31st July 1854. Passed the ‘Jason’ off Start Point. 1st August 1854. Arrived at Portsmouth from Constantinople. 26th August 1854. Arrived and sailed from Malta for Constantinople. 14th November 1854. In Balaclava Harbour when a gale stuck, sinking the ‘Prince’ which was outside. “The ‘Harbinger’ suffered a lot of damage. Nearly every ship broke adrift, and all are injured more or less. She lost the figurehead, catheads, forecastle rails, poop ditto, side ladders, and, indeed, all outside work was much chafed and broken. The hull and machinery were in perfect condition, as also our masts and yards. She helped in the rescue of some of the crew of the ‘Prince’. 12th January 1855. Sailed from Scutari, at 5 p.m., Commander Sharp. 18th January 1855. Arrived at Malta, 12 p.m., from Balaklava with invalids. One died on his passage to Malta. 19th January 1855. Sailed from Malta at 8 p.m.
26th January 1855. Arrived at Gibraltar at 5 p.m.
28th January 1855. Sailed from Gibraltar at 4 p.m.
5th February 1855. Arrived at Southampton at 4 p.m.
6th February 1855. Sailed from Southampton at 11 a.m. and went into Portsmouth Harbour to land wounded officers and men from Scutari, but was later order to sail to Chatham before the men were landed. There are many badly wounded from Alma and Inkermann, as well as Balaklava, and these are going on very favourably towards convalescence. The dysenteric and fever invalids are much the worst looking of the whole, but all are most grateful for their treatment at the hands of their medical attendants, and especially for the kindness of Lady Smith and Major-General Sir Frederick Smith, R.E., who go repeatedly, and with their own hands dispense liberally such delicate luxuries as jellies, custards, blancmanges, rusks, biscuits, buns, sponge cakes, and such like relishing conjectures. Lady Smith also gives those who can write memorandum-books, pencils, postage-stamps, and paper to write to their friends. 7th February 1855. Sailed for Chatham, Captain Sharp, Later detained at Spithead due to the violence of adverse winds and a heavy sea in the Channel. 11th February 1855. Sailed from Spithead for Chatham without the slightest symptoms of “mutiny” having been exhibited by her crew, as has been reported. 13th February 1855. Arrived at Gravesend from Balaklava. 12th March 1855. Being laden at Blackwall with stores for the sick and wounded at Scatari, and munitions of war for the Crimea. 2nd April 1855. Passed Deal from London for Balaklava. Transport ? 85. 23rd May 1855. Sailed from Kazsteh. 26th May 1855. Sailed from Scutari. 3rd June 1855. Sailed from Malta. 18th June 1855. Sailed from Gibraltar. 18th July 1855. Arrived at Spithead with troops. 20th July 1855. Arrived at Gravesend from Constantinople. 13th August 1855. Sailed from Woolwich for the Black Sea with a full cargo of guns, shot, shell, etc., and a heavy battering train, plus three officers of the Riffle Brigade. 26th August 1855. Arrived at Malta from Woolwich. 27th August 1855. Sailed from Malta for Spithead. 24th October 1855. Was despatched for Constantinople for the purpose of obtaining a supply of vegetables as scurvy had appeared among the troops. 18th November 1855. Arrived at Malta from Balaklava and Constantinople. 27th November 1855. Arrived at Gibraltar. 6th December 1855. Transport ? 86, Passed Deal from the Black Sea for London. 19th December 1855. Sailed from Gravesend for Balaklava. 21st December 1855. Passed Deal from London for Balaklara. Steam transport ? 85. 31st December 1855. Sailed from Falmouth with stores for Malta and Balaklava. 8th January 1856. Arrived at Gibraltar. 11th January 1856. Sailed from Gibraltar for Malta. 21st February 1856. Arrived at Malta from Scutari. 23rd February 1856. Sailed from Malta, Captain Vellacott, steam transport ? 86. 1st March 1856. Spoke to, in lat. 37•25, long. 9•3W the ‘Sovereign’ and the ‘Mazagran’. 2nd March 1856. Spoke to in lat.39•42, long. 9•55W, the screw steamer ‘African’. 4th March 1856. Spoke to in lat. 44•21, long. 9•9W, the brig ‘Charles’. 6th March 1856. Spoke to in lat. 48•29, long. 6•2W, the Danish brig ‘Anne Lorgiane’ and the screw steam transport ‘Candia’. 8th March 1856. Spoke to in the Channel the schooner ‘Julliet’, the ‘Dragon’ 6, paddle frigate. 9th March 1856. Arrived at Spithead from the Crimea. She brought back some officers, plus three distressed British subjects and three labourers from Balaklava. 11th March 1856. Arrived at Southampton and will be immediately refitted. Transport No. 86. 12th March 1856. Has been taken up again by the Government. 19th April 1856. Spoken to in lat 36N. long 49W from Mauritius for London. 26th April 1856. 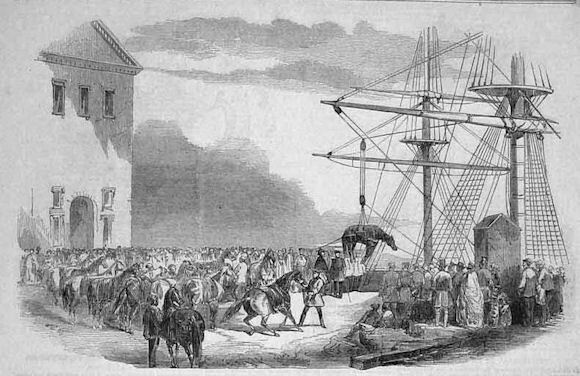 Sailed from Southampton for Balaklava for the purpose of bringing home horses and troops. She will call at Plymouth to take on board bread. Transport ? 86. 30th April 1856. Arrived at Plymouth, Captain Vellacot, to load provisions for the Crimea. 14th May 1856. Arrived at Malta from Plymouth. 15th May 1856. Sailed from Malta for Balaklava. 10th June 1856. Arrived at Malta from Scutari with stores. 27th June 1856. Arrived at Spithead in company of the ‘Agamemnon’ whom she lent some aid in taking her up Channel. Her cargo consists of salt provisions and limejuice, Commissariat stores, transport bedding, invalid utensils, and medical comforts, plus officers and troops. 14th July 1856. Arrived and passed Deal from London for Southampton. 18th July 1856. Sailed from Gibraltar. 25th July 1856. At Southampton no longer used as a Government Transport. Waiting for re-employment. 21st September 1856. Arrived at Gravesend from Cochin. 14th October 1856. Sold to the Russian Government. 4th November 1856. Passed Deal from London for Cape Verde. 14th March 1857. Arrived at Falmouth from Alexandria for orders. 13th May 1858. Passed Deal from Alexandria for Antwerp. 17th July 1858. Passed Deal from Demerara for London. 20th August 1858. Passed Deal from Cardiff. 4th April 1859. Passed Deal, in tow, from London for Bombay. May 1859. Refitting at Port Elizabeth and will be sailing soon, homeward bound. Commander Chapman. 25th June 1859. Arrived back at Algoa Bay due to hull leaking, and with the loss of foremast and jibboom. 5th March 1860. Condemned and sold as unseaworthy at Port Elizabeth. With the machinery moved, the hull was sold for £200.